Perhaps you’re in construction or some other industrial setting, you can imagine the numerous perils that lurk and hazards that can occur in the blink of an eye. In this scenario surely you’d welcome any kind of physical protection, especially for your precious feet right? Perhaps you’d agree that to protect your feet against hazardous falling objects and compression is top of your safety list? Not only do good safety boots protect against things crushing your feet, but many of the best steel toe boots are also equipped and ready to protect against electric shock by cleverly channeling electricity back into the ground. 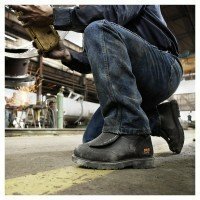 Why wear safety shoes you’re still wondering? The price difference between standard work boots and a pair of decent steel toed boots is usually no more than the price of your khakis, so to lose out on extra protection would be illogical to say the least. Some people may have no choice in the matter, for example the Occupational Safety & Health Administration and the US Department Of Labor has not only set out consensus standards for protective footwear to comply with, but also states in regulations standards number 29 CFR 1910.136 that “The employer shall ensure that each affected employee uses protective footwear when working in areas where there is a danger of foot injuries…” Therefore as an employee your employer can impose you wear steel toed boots as part of your uniform. Failure to wear the correct standard specified boots outlined by your employer may result in them sending you home as they, and you could be in breach. So to wrap up, if you’re going to need some steel toe work boots which you’ll potentially be wearing upto 8 hours or more per day, it makes sense to buy comfortable pair which you’ll look forward to donning each morning and boasting about to your colleagues. When most people think of safety footwear the immediate picture that comes to mind is boring looking ugly military boots. That’s not quite the case anymore, because some of the trendiest and mainstream fashion brands also sell shoes with metal caps now. 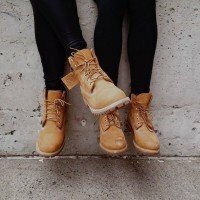 For example, it’s sometimes hard to distinguish the difference between a pair of Timberland steel toe boots and a pair of their everyday fashion items. In modern times, some rough, rugged or gothic styles also incorporate heavy duty steel toed boots into their attire. As a fashion item they’re nothing new infact, because footwear such as the Dr Martens have been popular since the 1960’s with skinheads, and by the late 1980s, they were popular among scooter riders and punks. Additionally, most people automatically correlate typical safety boots with the workplace; although yes this is quite the norm, a large majority of safety footwear is required for people carrying out everyday activities such as riding a motorcycle or a horse. So, even outside of the workplace you can seamlessly incorporate safety into fashion. A fact which is often overlooked and under-discussed is that steel toe shoes are surprisingly good for people with various foot conditions. In particular it’s a decent option for bunions due to the often generously roomy toe box. Wide toe box shoes are great for bunion feet because of the lesser friction on the bone. Bunions aside, they’re good for plantar fasciitis too. Plantar fasciitis shoes should not flex too much, and so the solid, durable and fairly rigid nature of certain safety shoes helps reduce pain in the foot caused by the painful condition. For anyone working continually or standing on your feet all day, muscle fatigue is one of those things which is almost certainly going to catch up on you, especially if you’re wearing the wrong kind of footwear. Fatigue is what occurs when your body grows tired, particularly in areas such as the feet, legs, back and other parts of the body, primarily because of inadequate support from the interior of the shoe being worn. A fatigued employee will be less productive, stressed, in physical pain, and at risk of musculoskeletal disorders. Most people don’t realize, but a large majority are actually wearing footwear that is already too old and needs replacing. A shoe may look intact on the outside, but the interior could be failing you. To avoid becoming fatigued it’s important you wear the most comfortable footwear within your budget, which should ultimately cater for good arch support, heel padding, roomy toe box, and a relatively cushioning rubber on manmade sole.